Every weekend, the 24/7 digital channel CPTV PBS Kids features Family Night programming. Enjoy movie specials and themed programs for the whole family on Fridays from 7 to 9 p.m., with features encoring on Saturday and Sunday evenings. On October 13-15, the Family Night presentation will be The Cat in the Hat Knows A Lot About Halloween. 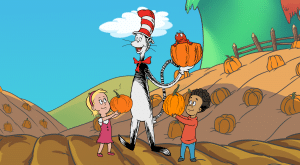 Watch as the Cat in the Hat takes Nick and Sally on the craziest Halloween ride filled with howlers and shockers and scary fandangles, big laughs and music and fun from all angles! Their fright-filled adventure takes them deep into the Oooky-ma-kooky Closet where Nick and Sally discover the very best Halloween costumes ever! The digital channel CPTV PBS Kids will also feature a Super Spooky Halloween Marathon on the weekend of October 20-22. See special Halloween episodes, including new episodes of Splash & Bubbles and Odd Squad, plus much more. 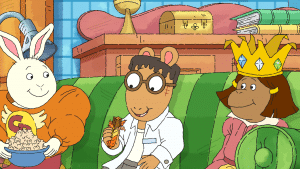 Finally, tune in to CPTV on Monday, October 23 at 3 p.m. for a new hour-long Arthur Halloween special, “Arthur and the Haunted Tree House.” While trick-or-treating, Francine meets an old woman with a very mysterious past, while Binky finds himself at Mr. Ratburn’s amazing haunted house (it’s scarier than math class!). Meanwhile, Muffy and Bailey decide to cut through a dark, rainy cemetery, and as for Arthur, Buster, and Ladonna, their tree house sleepover seems to be haunted…but by what? This special will encore on CPTV on Friday, October 27; Monday, October 30; and Tuesday, October 31. So enjoy a month full of spooky surprises both over-the-air on CPTV and streaming on CPTV PBS Kids!